Al Velocci provided the most challenging Mystery Foto of 2016. What is the exact location of the building and the orientation of the photographer? Provide a rationale using evidence in the photo. 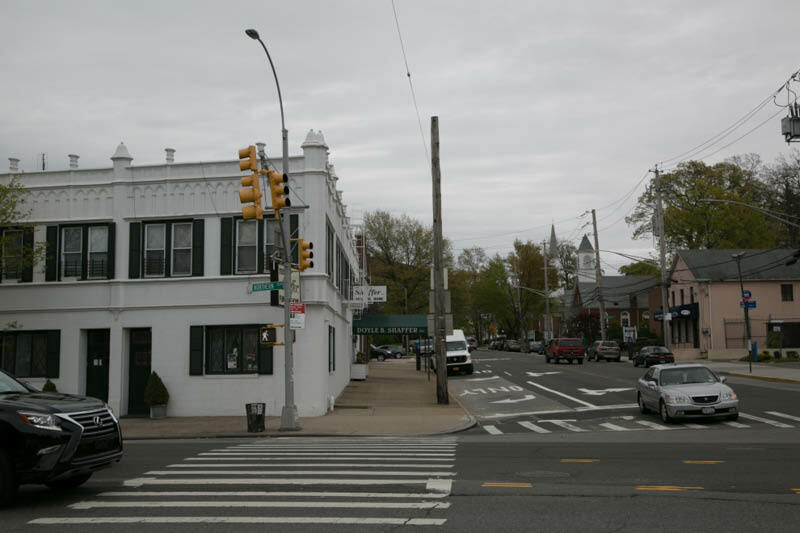 The building was located on the south-east corner of the intersection of Northern Boulevard and Little Neck Parkway in Little Neck. The building was catty-cornered at the intersction which made the directional signs a big challenge. See below images provided by Gary Hammond and Greg O. What was Vanderbilt Field? Where was it located and what is on the site today? In 1923, William K. Vanderbilt, Jr. purchased an old cottage and farmland near his Deepdale property off Horace Harding Boulevard. 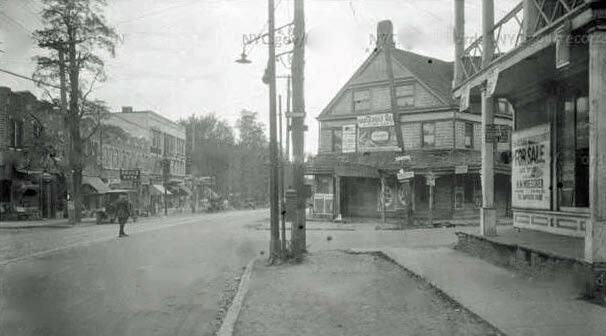 In the 1920s, this area was considered Little Neck but later became part of Lake Success. Willie K. built his Poultry House on the property. 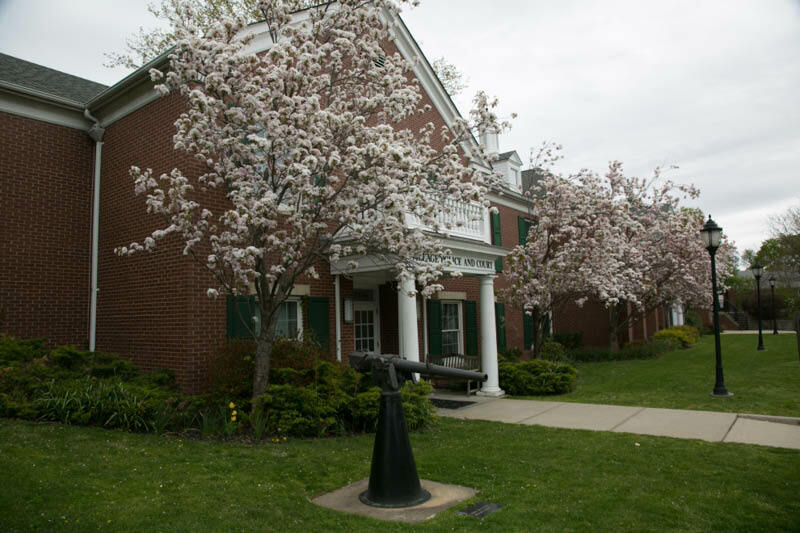 Vanderbilt, a Naval Captain during World War I, made this property, renamed Vanderbilt Field, to the 6th Battalion of the Naval Reserve for training and recreation. 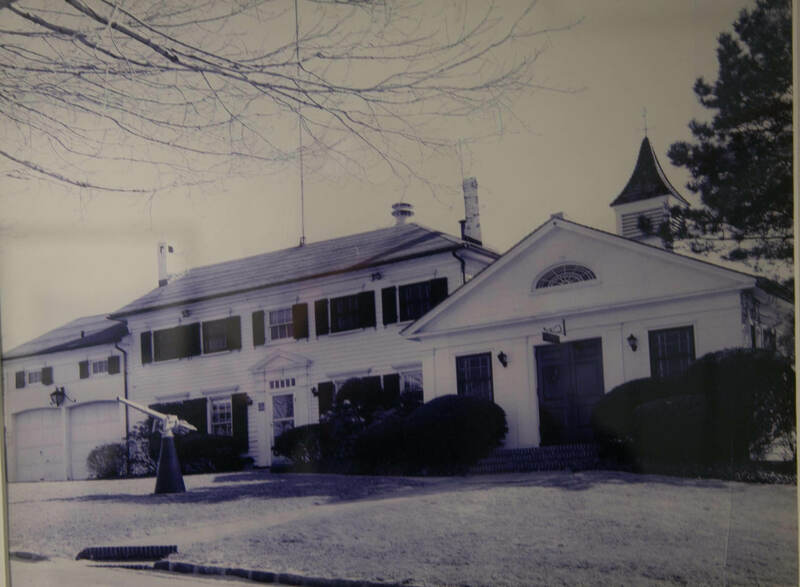 During the summer of 1938, it was also used by Pierce Country Day Camp, now located in Roslyn. 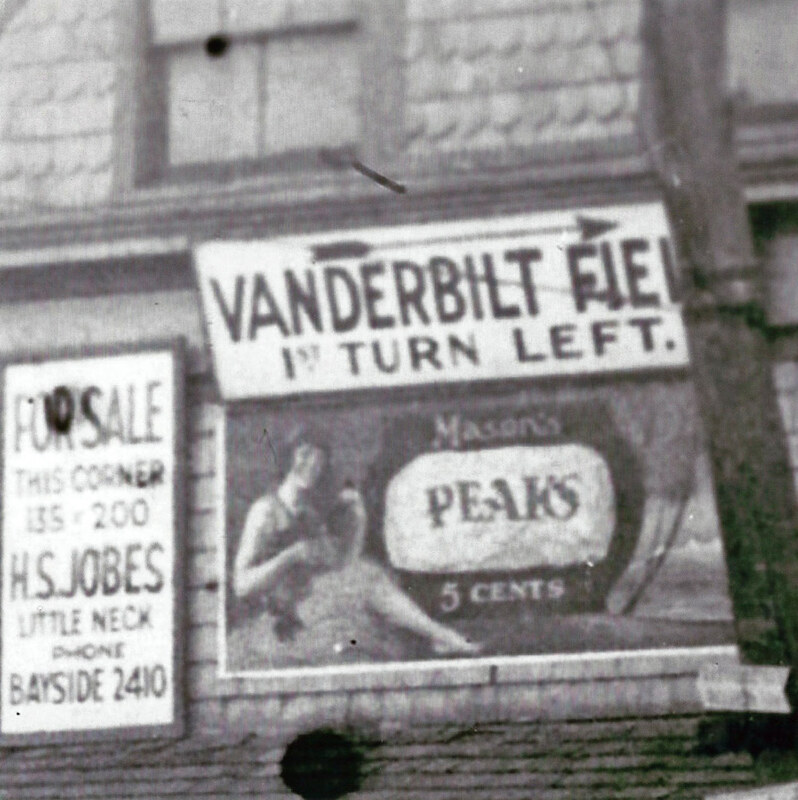 In 1944, after Vanderbilt's death, the property was acquired by the Village of Lake Success. The cottage served as the Village Hall until 1958 until its was relocated to the former Deepdale Golf Club cluhouse. The Lake Success police department and court remained in the cottage until it was replaced in 1996. What was the likely Motor Parkway entrance that the sign was pointing to? The sign was pointing to a route to the Great Neck Lodge on Lakeville Avenue in Lake Success. What was the approximate year of the photo? Provide a rationale. As discovered by Gary Hammond (see below Hammond's Historical Happenings), the photo was taken on October 7, 1926. Bonus: What type of business was located in the building? Who was its owner? The hotel was owned by Frederick Snell, who also owned the Broadway Hotel in Bayside. In payment for the Motor Parkway sign, Snell received a free Motor Parkway license plate for the life of the sign. Congrats to Steve Lucas, Greg O., Robbi S. and Gary Hammond for correctly identifying the Little Neck location of this very difficult Mystery Foto. Super kudos to Gary Hammond for finding the original 1926 source for the Mystery Foto and an amazing analysis of the Foto. Check out the below wonderful reference documents and images provided by Gary, Greg O.,, frank Femenias and Art Kleiner. 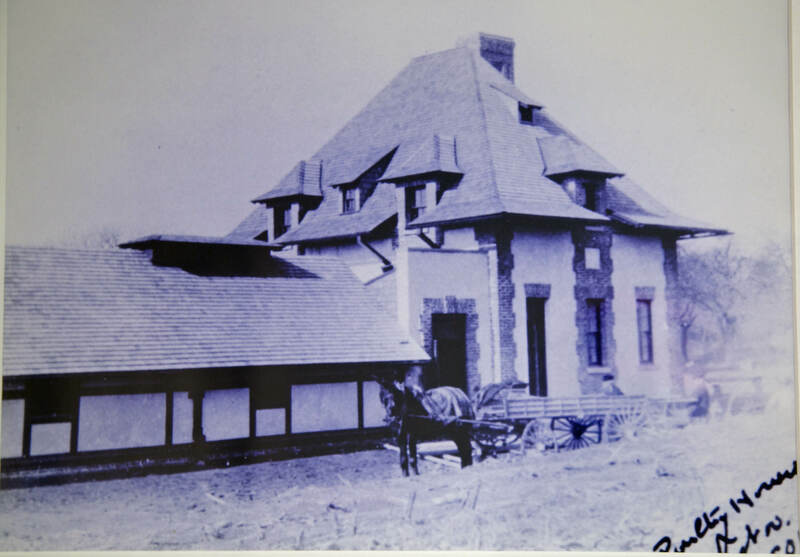 William K. Vanderbilt, Jr's Poultry House that was located at Vanderbilt Field. 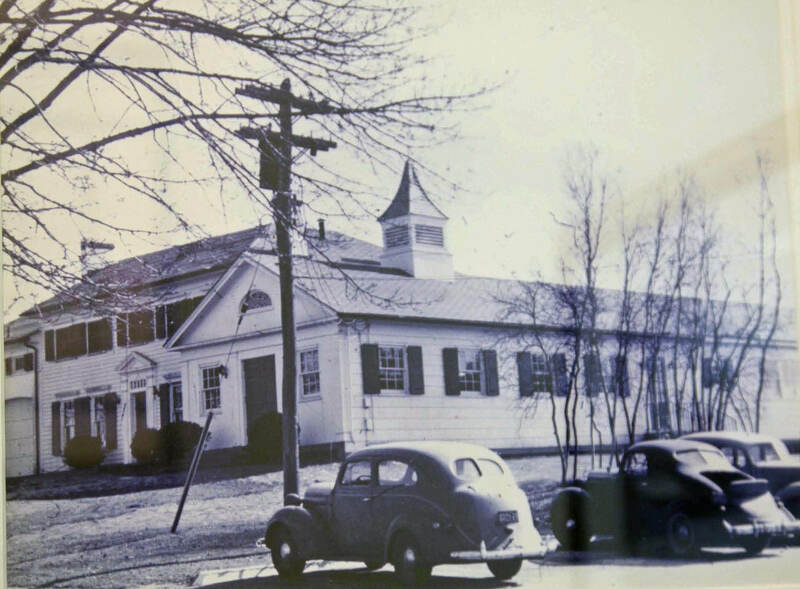 The Village Hall and Police Station of Lake Success at the former Vanderbilt Field as seen in 1946. The Village Hall and Police Station as seen in 1965. 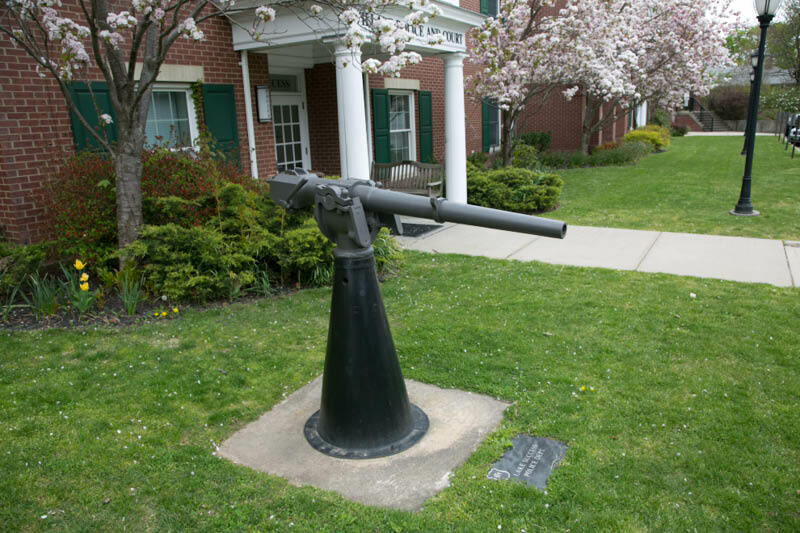 The naval gun was donated by William K. Vanderbilt, Jr. when he made this property available to his Naval Reserve. Look familiar? 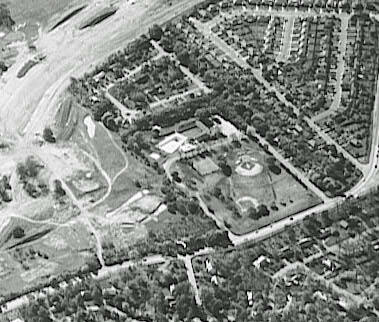 This is the Skyviews 1956 aerial of the Village of Lake Success Village Park. 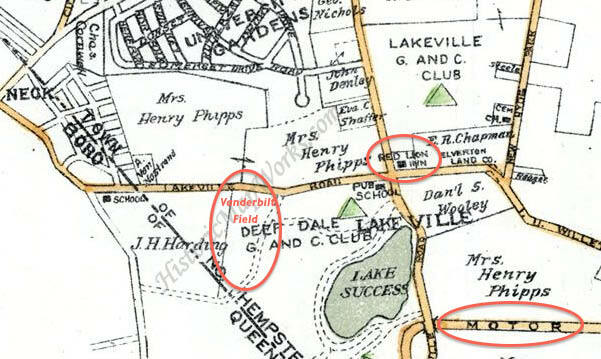 Location of the Village Park in relation to the Lake Success Golf Club (formerly the Deepdale Golf Club.) This aerial shows how the Long Island Expressway was built right through the former Deepdale course. The only reminder of Vanderbilt Field is this road sign on the corner. -"For Sale This Corner, H.S. Jobes, Little Neck"
The Brooklyn Daily Eagle, January 8, 1928. 1924 aerial of Little Neck Parkway and Northern Boulevard. Art: Pretty interesting stuff on this week's photo, Howard. Curious to find out what the building was. Here's some info. 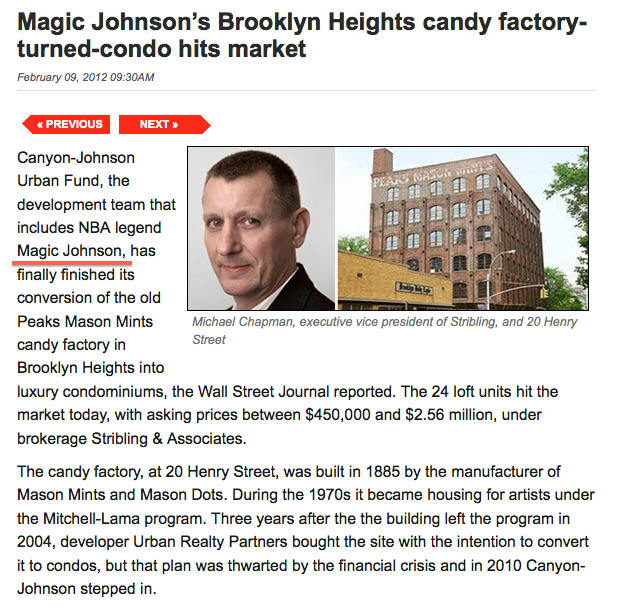 on Vanderbilt Field, Community Church of Little Neck and Peak's mints (bought by Tootsie Roll and having a Magic Johnson connection) that might interest readers. 1939 Map. Was Dale Carnegie a nearby resident? 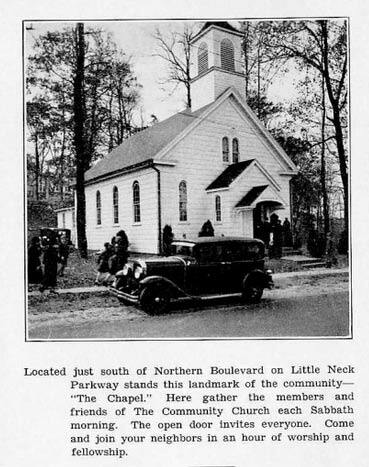 1933: The Community Church of Little Neck ;located on Little Neck Parkway. Current view of the Village of Lake Success Village Park, formerly Vanderbilt Park. Current view of the sourth east corner at Northern Boulevard and Little Neck Parkway. 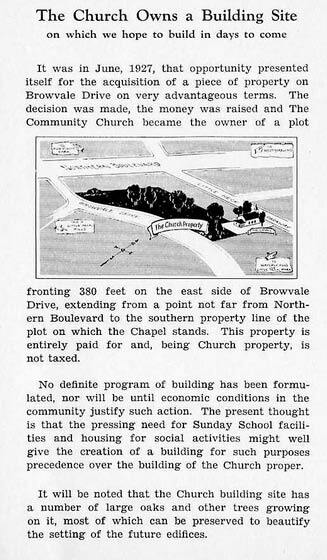 Note: The Community Church of Little Neck on the right on Little Neck Parkway. The Community Church of Little Neck today. The Village Police and Court Building built in 1996. The ship's gun donated by William K. Vanderbilt, Jr. remains in front of the police station today. Challenging indeed. Looking at this photo, I can literally feel my hair turning grey. I’m getting Shelter Rock, Little Neck, Bayside, and Mineola so we’re by the north shore somewhere. Don’t know if that’s gonna help. Another good one Al. Additional info. sent to Howard. What is the exact location of the building and the orientation of the photographer? Provide a rationale using evidence in the photo. I’m not very good with this type of question, but here goes. Based the arrows of the signs for the Red Lion Inn (located corner of Lakeville and IU Willets), Vanderbilt Field (which says to make the first left), Camp Upton and the Community Church of Little Neck I would put the building on Lakeville Road (west side), between I.U. Willets (also shown as Lakeville Road on some maps) and the Motor Parkway. All points of interest line up nicely, but having to make the first left to get to Vanderbilt Field, makes me think the arrows are pointing north. And the Motor Parkway arrow could be pointing south. 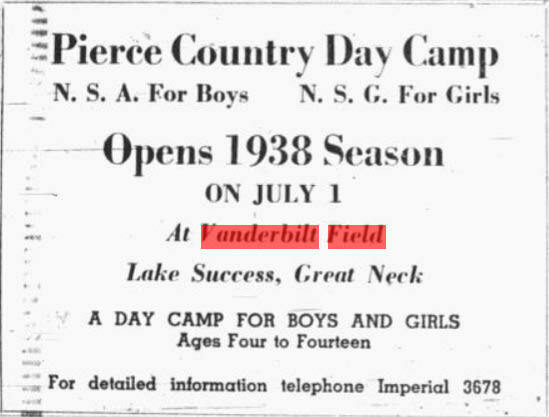 Vanderbilt Field was a park/athletic area in the 20s, 30s and 40s that was on Willie Vanderbilt’s Lake Success property (later off of a road aptly named Vanderbilt Road). It was often used by various groups (particularly the 6th Battalion of the US Naval Reserves) for picnics and athletics events. 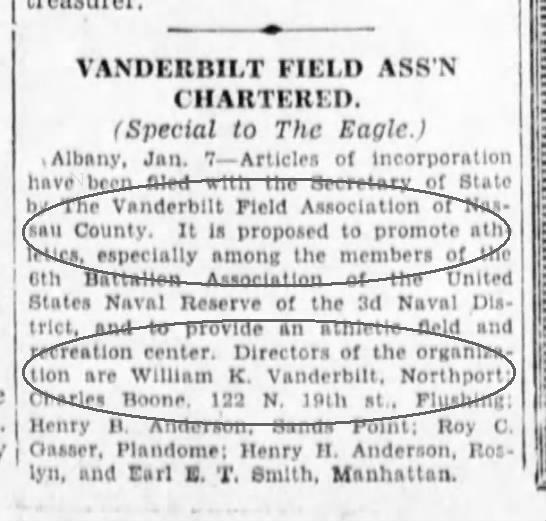 Willie K. bequeathed the property to the Vanderbilt Field Association in 1944 to promote athletics among members of the 6th Battalion and funded a trust fund of $50,000. Located just south of what sometimes was shown as IU Willets Road and sometimes Lakeville Road and just west of the Deepdale Golf & Country Club as shown in a 1939 map. Today the areas is the Lake Success Village Park. 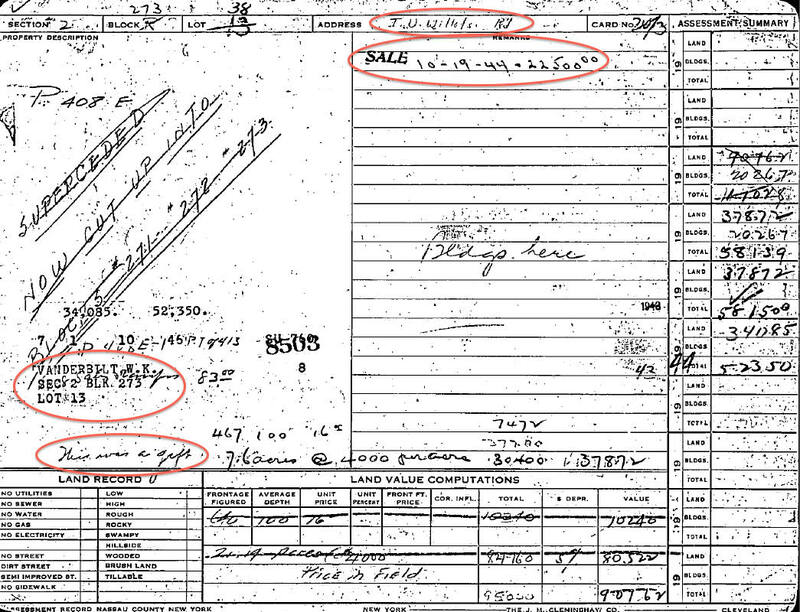 Nassau tax records show the property transferred as a gift in 1944 with Willie K. on the property record. Would assume the Great Neck Lodge and entrance. 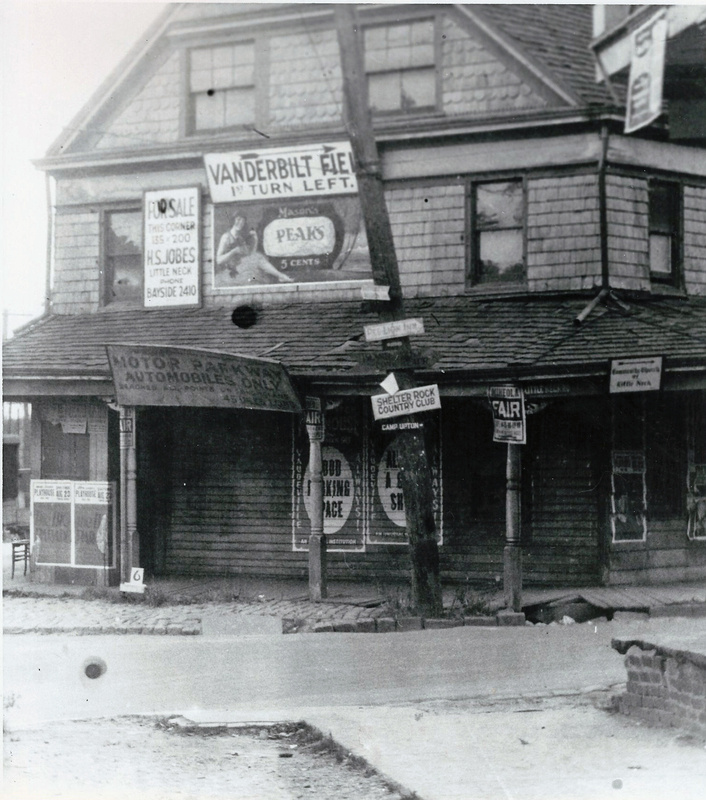 Between 1927 and sometime in the 1930s when the Red Lion Inn burned down. Unless the sign on the building was never taken down. Hotel, garage maybe? Did see it was for sale by H.S Jobes, real estate firm organized in 1915. I think the photographer is facing east at the intersection of Northern Blvd. and Little Neck Road (Parkway) with the building being on the southeast corner. 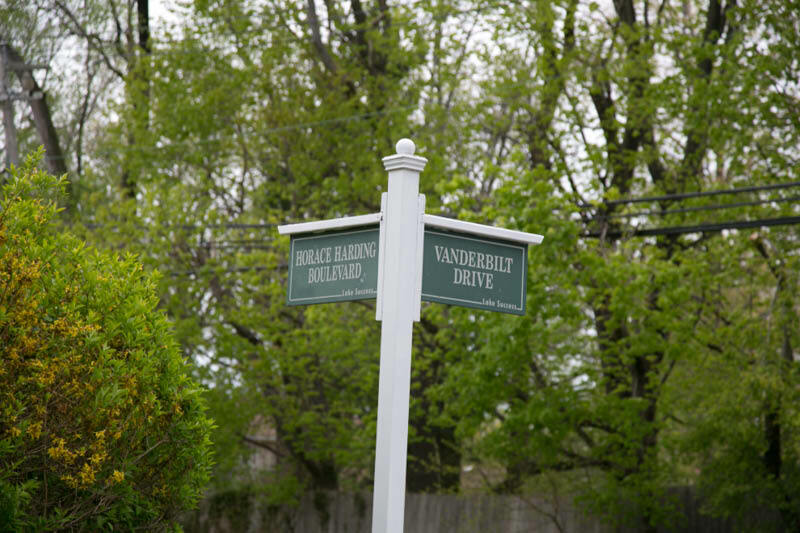 If you were to turn right (south) on Little Neck Road and follow the directions on the large white sign, you could get to Vanderbilt Field by taking the first left onto Bates Road. Vanderbilt Field was a Naval Reserve Training Center on the south side of Horace Harding Blvd. just slightly west of Lakeville Road. It is now the site of the Lake Success Village Park. The Motor Parkway sign is probably pointing to the Great Neck Lodge on Lakeville Road. I believe the photo is from about 1918 since Camp Upton was active then and was dismantled within 2 years after that. 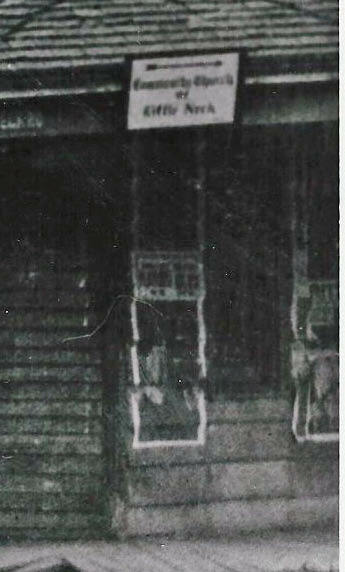 I think the building could have served as a candy/soda/cigarette store because of the large sign advertising Mason’s Peaks (similar to today’s Mounds). I’ll assume the owner was H. S. Jobes since his (or her?) name is on the for sale sign. I’ve spent enough time on this one and giving up to guesses. Here goes nuthin’! -What is the exact location of the building and the orientation of the photographer? Provide a rationale using evidence in the photo. I’m guessing this building is on the South East corner of Northern Blvd 25A and Little Neck Road (now Parkway) in Little Neck Queens. Photographer is on the South West corner looking East at the building. For me, signs pointing to the Community Church of Little Neck and Motor Parkway were the clues. 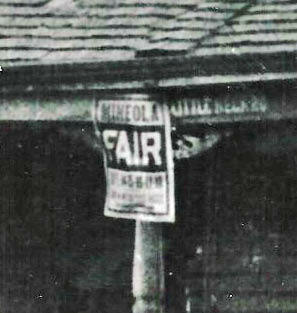 It’s difficult to make out, but the street sign for Little Neck Road can also be seen by the Mineola fair poster. Making a right there would bring you to the newly established Community Church down and on the right and proceeding further down Little Neck Rd/Pkwy would bring you to the 1st left (present Bates Rd/Horace Harding) towards Lakeville Rd. 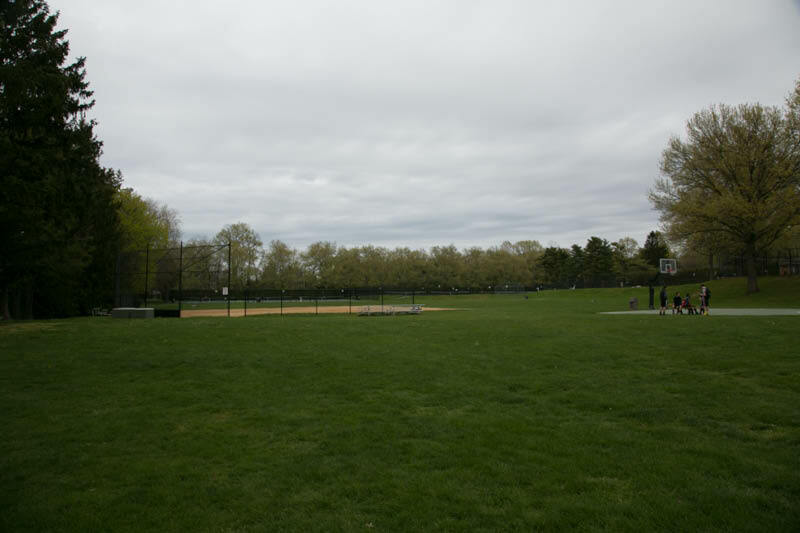 as the Vanderbilt Field and Motor Parkway signs suggest. 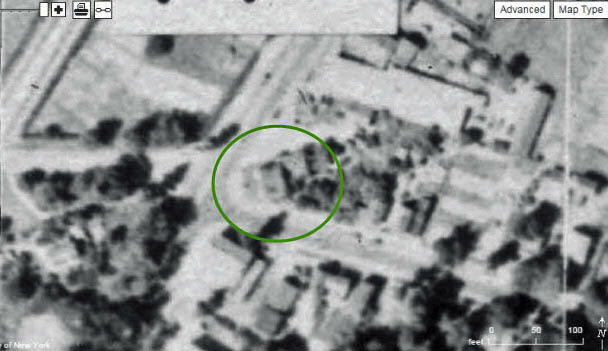 The building also appears to sitting catty-cornered, I’ve noticed in a 1924 aerial, there is a building sitting in that position on that corner. -What was Vanderbilt Field? Where was it located and what is on the site today? 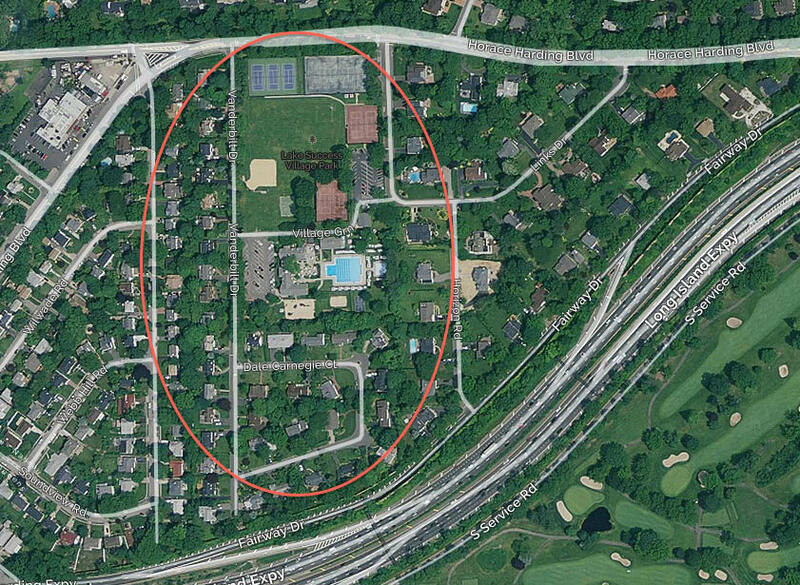 Maybe the land/fields Vanderbilt owned south of Marcus where present day Long Island jewish Hospital is. -What was the likely Motor Parkway entrance that the sign was pointing to? -What was the approximate year of the photo? Provide a rationale. 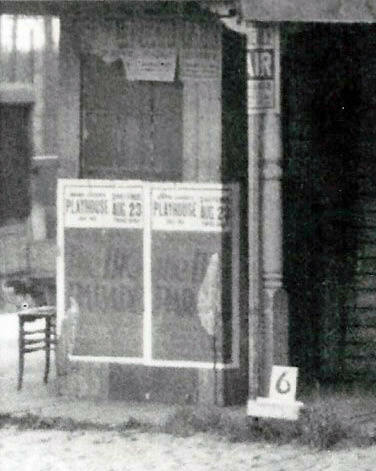 Great Neck Playhouse posters can be seen. Live theater was there from when it was built in 1925 to the very early 30’s. 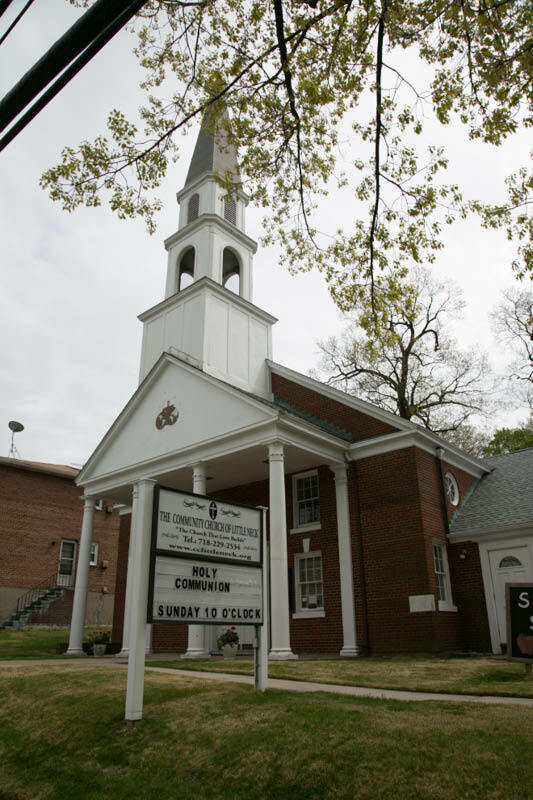 Also, the Community Church in Little Neck was established around 1926. My guess here would be sometime around 1926-29. -Bonus: What type of business was located in the building? Who was its owner? I’m unclear, but I’m sure someone will come up with Harry Jobes Real Estate sales records or Queens property records with some answers. 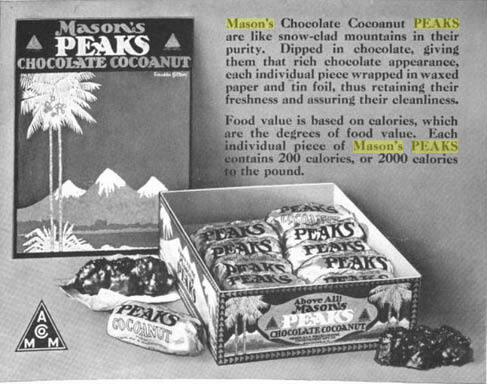 A quick guess, judging from the Mason’s Peaks sign, which was a popular chocolate coconut candy bar in the 20’s, would be this was a candy store or general store of some kind. The building was located at the south east corner of Little Neck Parkway (then Little Neck Road?) and Northern Blvd. The sign indicating Vanderbilt Field (Vanderbilt’s naval reserve base) is currently the Lake Success Village Park. 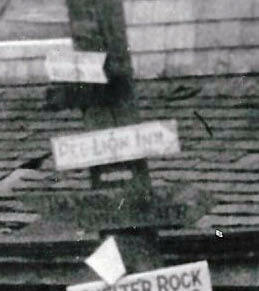 The “first left” indicated by the sign would be at what is now Bates Rd. The photo was taken between 1921 and 1927. 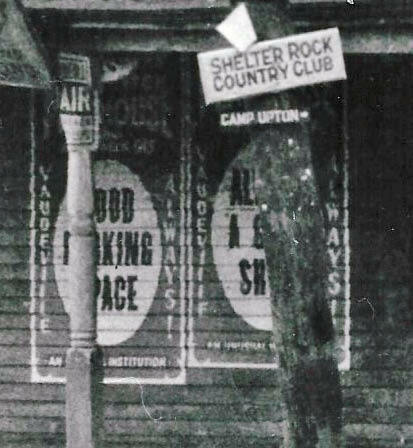 Camp Upton closed in 1921 and the Village of Lake Success was incorporated in 1927. The Motor Parkway entrance would be Great Neck. Stumped! 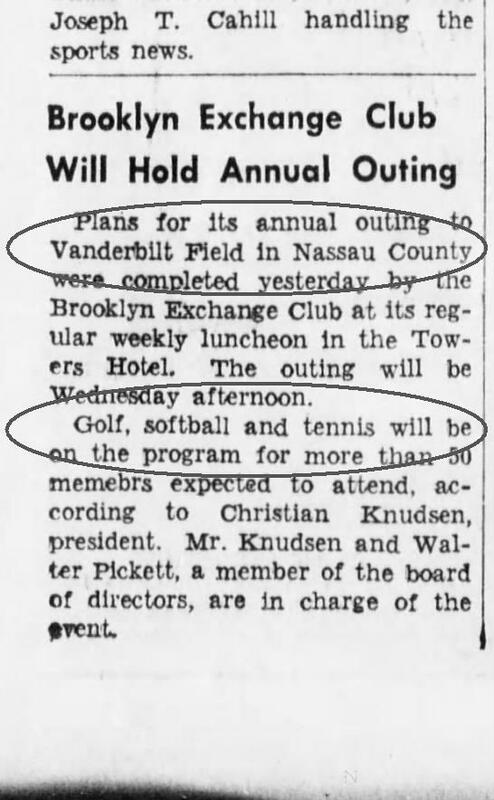 Only gathered the Vanderbilt Field was located somewhere in Little Neck, Nassau County and was used for athletic and recreational activities, Willie K being a director of the field. Harry S. Jobes was the manager of the Waverly Hills Real Estate Development Company. Hats off to anyone who solves this! 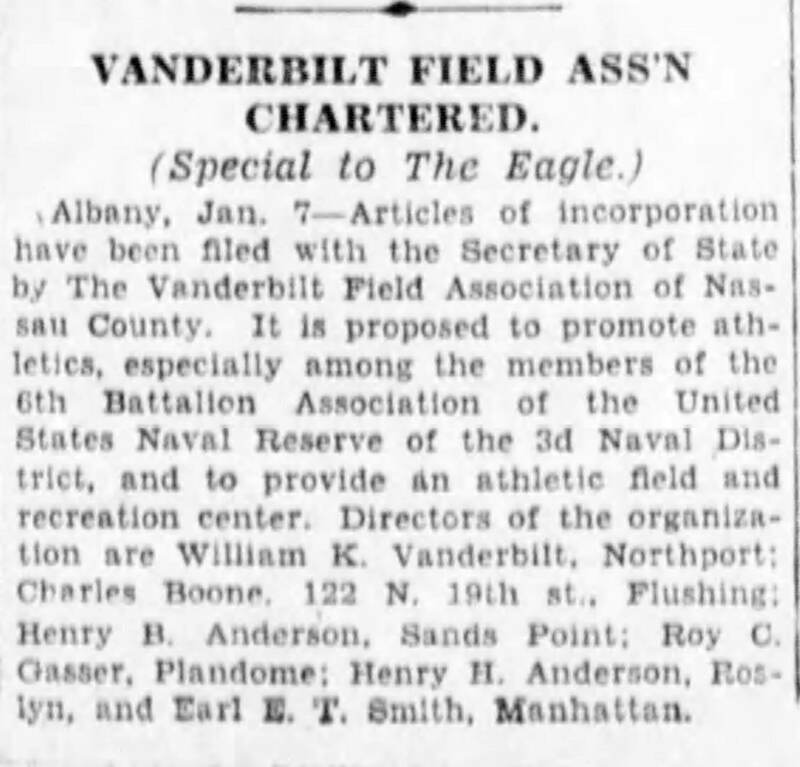 Vanderbilt Field: Vanderbilt Field was originally listed as being located in Little Neck; today it is part of Lake Success, located off of Vanderbilt Drive; The Field was chartered in 1928 as The Vanderbilt Field Association of Nassau County “to promote athletics, especially among the members of the 6th Battalion Association of the United States Naval Reserve of the 3rd Naval District”. Among the Directors was William K. Vanderbilt, Jr. (of course). (See The Brooklyn Daily Eagle, Sunday, January 8, 1928, p. 25.) The field already existed by 1924 as it is mentioned as being in use at that time. 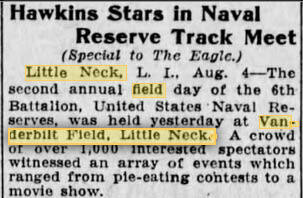 (See The Brooklyn Daily Eagle, Monday, August 4, 1924, p. 21.) When Wm. 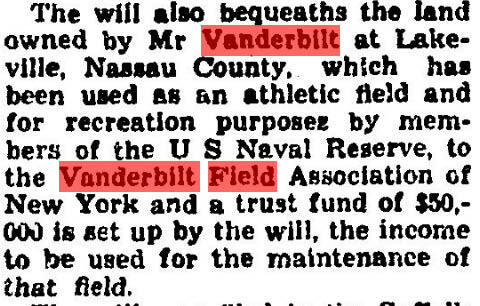 K. Vanderbilt died on January 8, 1944 he still owned the field; in his will he gave the property to the Vanderbilt Field Assoc. 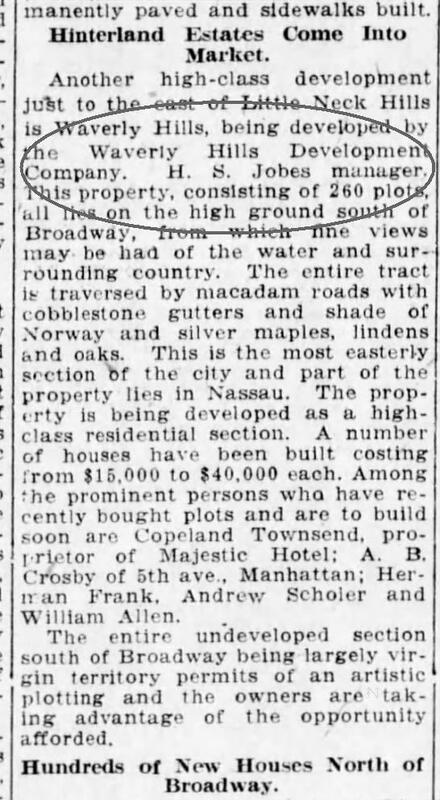 along with a trust fund of $50,000 for maintenance of the property (See The County Review, Riverhead, Thursday, January, 27, 1944) The property is now the Inc. Village of Lake Success’ Village Park. SIGNS…SIGNS…SIGNS!!! What a great collection of signs! Addendum: No. 6 Little Neck Rd also came up fruitless. The sign likely is pointing to the Great Neck Lodge off Lakeville Rd., and since 45mi of road is stated, this photo must be after 1928 when the western terminus was at Fresh Meadows off Horace Harding Blvd. Looking at The original uncropped photo, the buildings across the street from the mystery building on Northern are still there. The building for sale on the opposite corner has a ‘for sale’ sign on the front and I’ll assume this was razed for the Chase bank building there now. I missed the last couple of mystery photos ( away on vacation, boys week off from school ). This one that Al provided looked interesting and difficult. Not really having the time to delve into this one, I figured at least of couple of you would solve it. And that you did. Congrats to all. Always enjoy knowing what was the past and the present. Nice detective work. With the northside buildings still intact today, it’s possible the mystery hotel along with the other southside dwellings were all razed (or moved) at some point for today’s 7-lane expanded boulevard. Also Willie K’s poultry house at the field looks designed by John Russell Pope, similar to the original lodges. Frank, I agree. It appears to be designed by Pope.